Home Beers Brouwerij Rodenbach N.V.
Rodenbach Grand Cru | Brouwerij Rodenbach N.V.
Flanders Red Ale- a blend of 1/3 young beer and 2/3 aged beer matured for 2 years in oak foeders. The original sour ale. Draught pour into mini tulip glass. Aroma: Intensely sour, with some sweetness. Notes of green apple lemon-lime and herbal, slight orange citrus and tart & overripe cherry. Taste: Sweet on entry, green apple skin, lemon-lime, then a burst of cohesive flavors and a sour pucker towards the end. Finish is tart with green apple and cinnamon. Mouthfeel: Fizzy, foam, dry feel that leaves you salivating and anxious for the next sip. Overall: A wonderful, drinkable, exciting beer that makes you crave each sip. It is sour but a slight sweetness balances the palette. Enjoyed on tap at The Independent in Tampa, FL. Deep ruby red with dark orange trim, topped by a finger of white foam; nice lacing and and head duration, a very good-looking beer all around. Good aromas, nicely sour with some maraschino cherry sweetness, but more raspberry. The taste is excellent, really sour, almost puckeringly so, but with some sweet berry and cherry as well. Raspberry and blackberry are evident, with cherry in the finish. It reminds me of a delicious, sour version of Ommegang's Three Philosophers, no light comparison given my deep fondness for 3P. The mouthfeel is just about ideal--very smooth, but with a nice creaminess, a velvety finish that brings a hint of tart in the end. This really impressed me, so much so that ordering a second quickly on the heels of the first was in order. Fabulous beer, a very pleasant surprise. Highly recommended. A classic beer, and one I've yet to try. Tasted 11 July 2014. Pours deep cherry-wood rust brown, clear but dark. Two fingers of yellowish-tan head tinged with red. Smell is delightfully tart. Cherries, wood, and acidity. Lovely, if a bit on the simplistic side. Taste is outstanding. Starts out tart, bends fruity, then brings back the sour pinch. All the while little variations are playing on the edges, adding complexity. Definitely on the acidic side of balanced, but with enough fruit presence and balancing sweetness that it's not a straight paint-stripper. Yum. Feel is, likewise, outstanding. Full-bodied and robust, but airy and flowing as well, with medium-high carbonation that fizzes up and stirs the pot of tastiness. An excellent fit with the taste. No question why this beer is renowned. It's great across the board, nothing bad, and a whole lot good. Deliciously tart with just the right amount of fruit to complement it. I'll be drinking more of this. I wanted to try a sour and local beer store recommended. My first sour so I can't compare but I loved this beer. Maroon/dark red color. Smell is more tart then the taste. Not overkill on the bite and went down smooth. Can't wait to try my next. I've had a surprising amount of trouble finding this beer in my area, so when I finally was able to find it, I made sure to grab a few bottles. I've heard great things about this beer, and I'm excited to finally give it a go. It pours a deep, murky brown-ish color with some red and ruby hints when light is allowed to pass through it. Translucent with a bit of haze, topped off with a slightly beige head; big-bubbled and quick to fade away. The aroma is simply fantastic - one whiff and I already know this is going to be a winner for me. Incredibly layered and complex, each successive sniff brings about new aromas that I wasn't getting before; cherry skins, berries, balsamic vinegar, vinous grapes, heavy oak, tannic dryness, faint lemon... Just so much to take in. As a whole, the combination proves to be exceedingly tart and sour and I can feel my saliva glands starting to sweat just a bit. The marriage of the fruit and barrel aromas are exquisitely done here, and the level of sourness that my nose is picking up is great. The finishing dryness from the oak is enough to blunt the acidic characters just enough to keep you from tiring of the smell too quickly. Every once in a while, a beer comes along that will have you sitting and smelling it for minutes before you even bother to take a sip, and Rodenbach Grand Cru has done just that. When I finally bring the beer to my lips, my palate is met with a wonderful display of ripe fruits, straight out of the gate; cherries, grape skins, and more berries, all with insane, yet manageable levels of tartness. Each sip has me puckering my lips as the beer traverses to every corner of my mouth, injecting a solidifying sourness that's putting a smile on my face. I was hoping for sour, and the Grand Cru delivered. But it's not just the copious tartness of the beer that makes it enjoyable, as anyone can dump lactic acid into a beer and make it sour as hell. It's the crafted execution of how the sourness developed that must be appreciated, and the layered complexity of the flavor profile can speak to those methods. The tart cherries, the heavy grape skins, the dry oak, the mild vanilla, the heavy balsamic-like vinegar, the sharp yet delicate acidity, the delicate tannin, and the superbly integrated vinous feel make this beer almost as much of an art form as it is a drink. The mouth feel is nice for the style; thin, bordering on medium; my only complaint is that the carbonation in my bottle could have been higher. There isn't much more that I can say about this beer, other than the fact that it exceeded any and all expectations I had. I'm a big fan of sour beers, and I sure do love my American Wild Ales that stretch the palate towards unobtainable levels of tartness, but this beer proves that you can be both sour AND complex, and when done properly, it's a wonderful thing to behold. The fact that it's fairly readily available may be the biggest wonder of them all. This is a gorgeous and lush beer full of berry and grape - tart and clean, fresh and fruity - mild drying with little bit of pucker on the finish; flush of tingle on the tongue from gentle carbonation - very soft-feeling. Plush and delicate at the same time. Very fine. Recommended. Presentation: 33cl European-style brown bottle. Foil neck and an illustrated label of their famous oak casks. Appearance: Hazy dark red, almost deep brown in colour with a nice whisp of a white laced head. Smell: Acidic, sharp fruity aroma. Hints of caramel notes and oak as the beer warms. Taste: Crisp, dry and refreshingly tart. Has a very intense sourness and a raw cherry juice fruitiness about it. Body is perfectly balanced, full and gentle. A subtle background malt sweetness provides balance. Hops are masked by the instense flavours. Light malt grain and oak flavours as the beer warms. Finishes semi-tart, clean. Notes: Grand Cru is probably the most famous of the West Flanders red ales. It's made with Vienna malt and 5 yeast strains. It's then aged in massive unvarnished oak casks for over 2 years. Then, it's blended with other 2 year old ales, no young ale addition. There's no fruit in this beer. All fruit flavours are imparted by its unique house blend of yeast strains. Dear beergod, thank you. This is indeed one of the most refreshing beers on the planet. An absolute must try. Great brew and for the price a steal almost. Appearance  This is a deep, deep red in color that's borderline brown. The head was moderate and went down rather quickly, which is typical of the style. Smell  The tart cherry sweetness comes out way before the malt. The malt does eventually make itself known, but its quite wimpy here, much afraid of the big bad sour wolf. Theres an earthy character to this FRA as well, giving the bouquet some real substance. Taste  Mother pucker! This is one sour, uh, Sour Ale. Its not so much sour like a lemon as it is just super tart like an early-picked cherry. There are a lot of simple sugars here no doubt, but its the tartness that really sticks out. Its not cheap-tasting though like a lot of pretenders of the style. This is the real deal. Mouthfeel  This is a bit bigger than light-bodied with some saliva-activating mouth-puckering sourness that will send a shiver down your spine. Drinkability  This is a very intense FRA that begs to be shared. A: Pours a very hazy reddish brown color. Head looks very creamy and is of a cappuccino color. S: A very traditional Flanders red affair: you have the apple cider, slight vinegar, tart cherries, oak and a little bit of vanilla from the barrels. Slight indistinguishable funkiness is also present. T: It's all that was present in the smell: apple cider, a little bit of cider vinegar notes (just enough to be pleasant), quite a bit more tart cherries than in the smell, a lot more of oak and vanilla too. I'm surprised as this beer is bit sweeter and fruitier than expected, but it is still quite sour. Usually, I'm very critical of sour beers that are too sweet but this is definitely not the case here. Expertly balanced. M: Very smooth, almost creamy. Surprised by the mouthfeel as I expected a more traditional Belgian mouthfeel but is very very good too. O: One thing that this beer has in spades is balance. It is very complex but still highly drinkable. It is quite sour but has enough sweetness to not make it overbearing. It is fruity but also has a nice earthiness thanks to the barrel aging. Truly world class. Poured a dark brownish red, a pinkish white head and soapy lacing clinging to the glass. Nose was acidic, vinegar and like a dry red wine. Taste was quite something. The sourness shocked the tastebuds during the first few sips. But this diminishes as you drink, and some cherry flavour, some sweetness pokes through. Has qualities of a red wine. Mouthfeel was bubbly, finish was dry. But the tartness really limits the drinkability, at least for me anyway. Pour produced a light tobacco brown colored liquid. A one-half inch white head faded after a few minutes. No carbonation to be seen. A thin watery lacing is left. Sour cherries popped right out of the glass and into the nose. An earthy aroma of dried grass fades into the back of the nose. Oak hint is sweet when compared to the other scents. A sweet bitterness of tart red fruits. Cherries are extremely bitter but strong. Oak leaves a light vanilla in the very end, and only searching for flavors makes it appear. Watery body that leaves a clinging flavor on the tongue. Carbonation is strong as it tingles with the tartness. A very strong tartness. Worth pairing with a cheddar aged multiple years. A style that may not be suited for everyone. If you like something extremely tart, this is good for you. Finally got to try this classic and it did not disappoint. Poured a reddish brown body with one finger a head on top of an aroma of a lot sour and funky fruits, mainly a tart cherry aroma, a touch of wood and/or wine-like qualities and a a touch of sweetness. Beer is light bodied and smooth and not as sour/funky as it smells. The sour/tart cherry aspect is aplenty but there is a great balance of sweetness (whether it be candi sugar or fruit derived) and the funk aspect is minimal so it's not a overpowering, puckering sourness or tartness but just hits the right spot. Great carbonation so beer is lively and finishes real crisp. Just a great beer to sip with after dinner. Cellared almost a year to the date. Flute glass pour and I am met with a nice dark brown colored ale with accompanying brown/beige foaming head that lingers. The smell has nice oak and different dark fruits in the mix. Just a touch of the vinegar in the aroma. Very pleasant. Amazing taste. Sweet and sour are blended perfectly. You get the fruitiness up front followed by a slight acetic dose of sourness on the swallow. Very dry finish and the salivation keeps me coming back for another sip. Carbonation is there but that's to be expected. Overall I thoroughly enjoyed this beer. Not overly sour or harsh like some sours. Just a great blend as the Rodenbach crew knows exactly what they are doing. Great stuff! 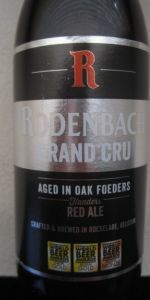 Rodenbach Grand Cru from Brouwerij Rodenbach N.V.